If you love color and would like to develop your psychic abilities then this is the class for you. This class will offer you an opportunity to learn a non-intrusive way for Divination utilizing COLOR. Divination is the practice of gathering hidden information with the intention to aid the individual in future events giving the necessary information to make decisions and choices that are in their best interest as well as making them aware of any obstacles or blocks that are standing in their way. Those that have had a color reading with me know the power and depth of the information gathered through this form of Divination. Folks have been amazed at the information I give them commenting on what an amazing psychic I am, trust me it is understanding the language of color that allows me to pass on this valuable information to my clients, I can teach anyone how to utilize COLOR and give a reading. Let me ask if you could gain insight, be of assistance to your child, family member, spouse, client, teacher, student, patient any and all folks in your life that matter including yourself wouldn’t you want to learn this form of Divination? You will receive a certificate of completion “Divination through Color” along with this certificate you will also receive the necessary forms and a deck of Color Cards so that you may practice this form of Divination on your clients, family or friends as well as yourself for insights into the future as well as present. For those of you who would like to earn another source of income completion of this course will provide the opportunity. Regarding the Color Cards they may or may not be used in your color divination session that is up to you. I find for me the Color Cards give added information and as Color is a non-intrusive universal langue most folks welcome the Color Cards. Having given thousands of Color Readings throughout the years some including an Aura Photo as well as the Color Cards the more you incorporate into your session the more information you are able to give your client. Regarding the color selection form that is the foundation of the course at this time I have professionals using this form in their business’s to gain a better understanding of gifts as well as challenges their clients, patients, employees, and students etc. are experiencing. Example of folks using theses color selection forms range from psychologists, teachers, medical professionals, and cancer centers for both patients and their families, human resource personnel as well as mothers to gain information to assist their children when needed, again this is just an example of some of the folks that are practicing “Color Divination”. 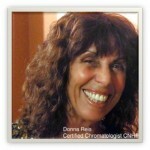 The “Color and Divination” class is still accepting students please contact Donna to register for this ongoing class. The total cost of the class is $499.00. For questions please call me at 817-788-9451.